Happy Five Minute Friday! I’ve sure missed posting these the last couple weeks and I have a great one for you today! This project will be one of my Make & Takes at the Just Crop Retreats tomorrow. If you’re looking for some time away from home with girlfriends, Rachel does an excellent job with these retreats. Next year, there will be seven retreat weekends, lots of dates to choose from. When I first received my Holiday Catalog, I saw the Jolly Friends stamp set and coordinating Jolly Hat punch and thought they were kind of cute. But, I wasn’t sure how much use I would get out of it so I kept skipping over it. Then I came to a point where I really wanted the Jolly Hat punch for a couple different cards. I figured I would take the leap and get the bundle. Since the holidays are right around the corner (yikes), I knew I wanted one of my Make & Takes to be useful. And a gift tag is definitely useful. I love that the Scallop Tag Topper Punch lets you create a tag in any length. I cut my Crumb Cake card stock to 2″x5″ , which gave me plenty of room to work with. The coordinating punch is for the Jolly Hat only. All the critters and guys have to be hand cut out. The moose antlers are a little challenging to cut out but it can be done. 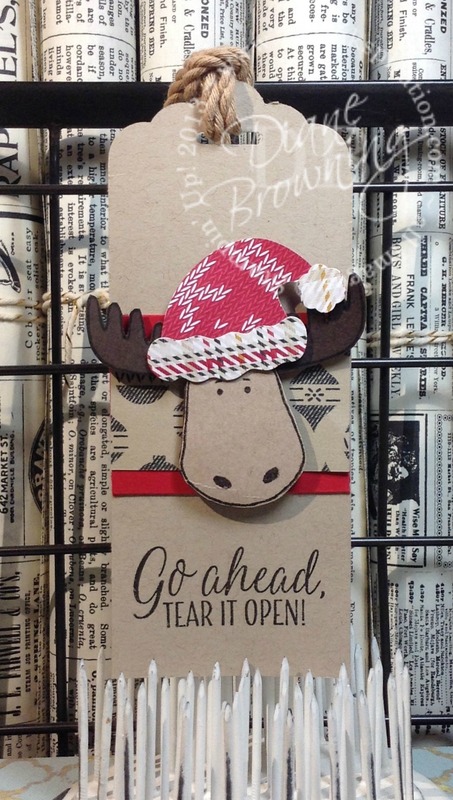 I stamped the entire moose on the Early Espresso card stock, then I stamped it a second time on Crumb Cake. You only need the face in the Crumb Cake and then you can layer it on top of the early Espresso moose. The pattern paper in the Jolly Hat and the small background piece are from the Warmth & Cheer paper stack. So many great patterns in this stack. It comes in a 6×6 size with 48 sheets and I’ve already used most of my stack. I might have to pick up a second one so I can make more of these tags! Don’t forget November’s Special! My Stitched Framelits should arrive this weekend. I have seen some amazing things that others have been doing with these dies and I cannot wait to play with them myself.